Teaching ESL to Adults: "It Sure Has Been Cold Lately"
Experiences, resources, grammar tips, lessons plans, and more from an English as a Second Language Tutor. Also, notes on teaching one-on-one and being self-employed. "It Sure Has Been Cold Lately"
Yesterday at one of the coffee shops I use as an "office," the owner/server started making small talk about the weather. (It was cool and drizzly.) As an ESL tutor, these seemingly inconsequential conversations are not wasted on me. "Small talk" is one of the frequent areas of concern for many of my ESL students working as professionals in the U.S. Native English-speakers take this for granted. No big deal. But for English language learners, small talk can be a challenge. Appropriate topics for small talk, how much small talk to make, when is it appropriate. All these are concerns for my ESL students. So when the coffee shop owner from Morocco started talking about the weather, it did not go unnoticed by me! Yes, small talk is absolutely necessary! My students often tell me that no matter how much they've learned, they always get stunned when approached with the simplest of comments. This morning for example, when I walked in a few minutes late, I saw one of my students in the hallway and asked him quite casually: "Is everyone else here?" Well, I had to repeat this twice, and then finally say: 'Is everyone in class?' -Needless to say, we went over this in class; where I noticed that he wasn't the only person who couldn't get this immediately. So, yes, the simplest forms of conversation can never be taken for granted. Thanks for this post. I have you on my blog roll. Great posts. Most of the articles in this ESL blog are fairly short. 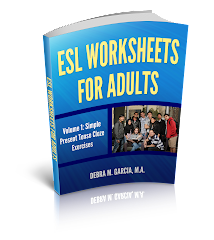 If you'd like to get more grammar points, ESL lesson plans, and other information related to teaching ESL, you can check out my website at Teaching ESL to Adults. Please contact me or leave your suggestions in any of the Comments sections of this blog. If you're building your ESL teacher's or tutor's library, the books below are those I highly, highly recommend. If you're using your own funds, try to get used copies. You'll save a bundle. I also highly recommend some of the above resources to my advanced ESL students. If you'd like to read more about each of these ESL books, please see my ESL Textbook Evaluation page. 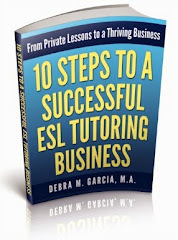 ESL Tutor is a blog about my experiences as a private English as a Second Language (ESL) tutor. Lesson plan ideas, resources for ESL handouts, grammar points, and some stories about my students are all included. Also, find tips on being a self-employed tutor. To learn more about the author of this blog, you can visit my about me page on my main site.